(DESHLER, Neb. 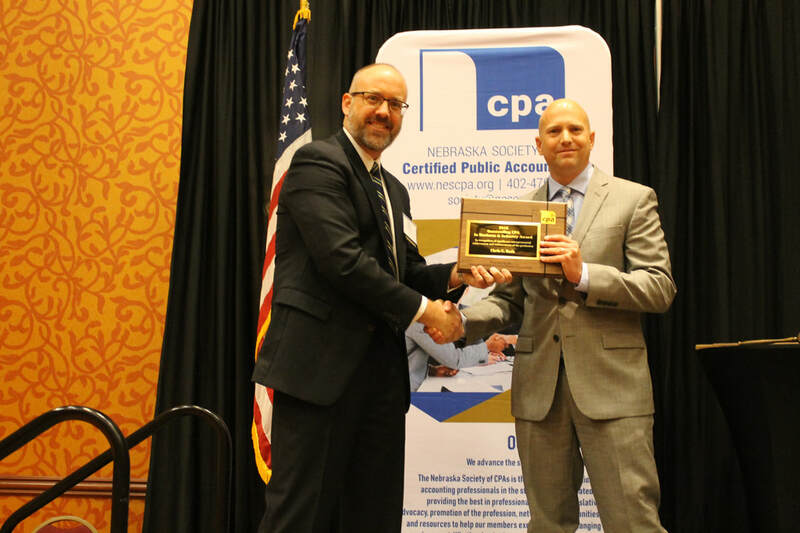 – Nov. 20, 2018) – Reinke Manufacturing President Chris Roth was honored earlier this month with the 2018 Outstanding Certified Public Accountant in Business & Industry Award by the Nebraska Society of Certified Public Accountants (CPAs). The award was created to recognize Nebraska CPAs who have made a significant contribution to the growth and success of their organizations. Roth began his career at Reinke in 1996 as an accounting manager. Over the next 11 years, he served the company in both accounting and leadership positions before being named president in May 2007. “I have always been impressed with how well Chris has run a respected Nebraska family company—a company with a name that is synonymous with essential agricultural products and irrigation equipment,” said Ryan Parker, 2017-2018 Chairman of the Nebraska Society of CPAs. Roth has also held leadership positions with several state and national organizations, including the Irrigation Association, the National Association of Manufacturers, Invest Nebraska, Blueprint Nebraska and the Nebraska Chamber of Commerce and Industry. Active in his community, Roth has served on the Thayer County Hospital Board of Trustees, the Parkview Haven Nursing Home Board of Directors and the Peace Lutheran Church Council. While at the society’s annual meeting to receive his award, Roth also had the opportunity to congratulate Lauren Schmidt, an accounting and business administration major at Doane University, as she was awarded a scholarship from the Nebraska Society of CPAs Foundation. Schmidt is a graduate of Deshler High School, where Roth also coaches the junior varsity girls’ basketball team. For more information on Reinke, visit www.reinke.com.